2018 vinyl reissue, first time Braille cover! 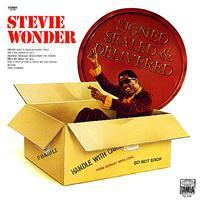 Stevie's unmistakable harmonica sound put a whole new spin on the Beatles' "We Can Work It Out" on this 1970 classic. That became a hit as did "Heaven Help Us All" and, of course, the title smash, one of his all-time classics! In the tradition of Stevie Wonder's classic LP, Talking Book, this title includes Braille on the cover for the first time.